I was raised Christian. Growing up, our family never missed church on Sunday. While I consider myself a fairly strong Christian, my faith life has risen and fallen throughout the last 10 years and continues to do so. 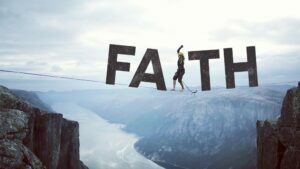 It seems to be natural and acceptable to have ups and downs in your life and in the strength of your faith. Unfortunately it’s a common thread in the world today with more and more people choosing life without Christ being a focal point. What’s really been on my heart lately is the inner battle with myself on the choices I make that I know wouldn’t be acceptable in the eyes of the Lord. We all have our faults, vices, and ways to cope with our lives which we sometimes take advantage of for the wrong reasons. The acceptability of society with decisions made that aren’t acceptable in our faith and in God’s standards make it extremely easy to ignore. Odds are good if you do something “wrong” most people in your life wouldn’t care or notice anyway based on what is acceptable today. So the only person holding you accountable to that is yourself which makes me realize how important it is to surround yourself with the right group of people. I often listen to sermons while I sit at my desk during the “research” part of my day at my job. Most recently the pastor gave a simple analogy of a farm and how chickens and pigs don’t hang out together. The chickens do their own thing and have their own way of life while the pigs also do theirs. Sure they know each other and probably consider themselves friends but a chicken is going to live the chicken life and the pig is going to live a pig life. The people you hang out with are going to contribute to the lifestyle and values that you portray on a normal basis. Surrounding yourself with a group of people who are going to build you up, but most importantly hold you accountable to who they know you are is rare today. Most people don’t have that. If you are a Christian, I’d challenge you to consider how many of your close friends also hold the same values as you. Who do you hang out with who you can talk to about faith on a normal basis. It’s a conversation I recently have been trying to bring up more often because it’s a pivotal part of my life and something I know I haven’t been doing enough of lately. Open conversation about faith even when we have differing believes is something we don’t discuss enough. Most of the time it’s because people aren’t open to it or feel uncomfortable doing so. Why? That’s life! Focus on your friendships. If you don’t have people in your life who hold the same values, build you up, push you to be better, hold you accountable and help strengthen your faith not hinder it.. find some! Lets go back to that inner battle. I know I’m light years from perfect. In fact I know there are many different opinions of who I am as a person based on who is reading this. Depending on when you met me and the lifestyle choices I was making at the time, many people’s feelings are drastically different. Most of us change a lot over 6 months, a year, 10 years, etc. But over the last 18 months I really have struggled with those daily life decisions and cutting out specific lifestyle sins I know aren’t living my best life. However, I am improving and I am taking steps toward making that change. I fail a lot. It’s a process, and an on-going battle of temptation but the first step is recognizing it. I don’t have a day shattering realization for you here by any means. I simply want to be real and challenge you to identify the life choices you are making right now or on a normal basis that you know aren’t pleasing to God. And challenge yourself to quit doing or take steps to cut it out of your life. Will you fail? HELL YEAH you will. I fail all the time, and luckily we’re forgiven for it. But, it’s important we continue to take steps forward. Not only will we grow from it as individuals but it will challenge the people you surround yourself with as well. Too often we choose to be “acceptable” when we need to focus on progress toward perfection.